As recovery efforts continue in Texas following Hurricane Harvey, many safety issues remain for businesses and their workers. If your organization has been affected or could be affected by the next natural disaster, read on to learn more about key safety issues. Thousands of people are involved in cleaning up from the devastation and flooding caused by Hurricane Harvey. The work can be slow and disheartening. It can also be dangerous. If your employees are performing recovery work, OSHA recommends you first assess the potential for hazardous conditions and/or exposures before starting work. Based on an initial assessment, the next step is to provide workers with the appropriate personal protective equipment, training, and information they need to work safely. While risks vary depending on the specific tasks and the environment, OSHA has outlined a variety of possible hazards and protective measures that may apply to your operation and crews. Ventilate enclosed spaces with fresh air. Assume that floodwater is contaminated unless proven otherwise. Allow only trained workers with the proper PPE to clean up toxic chemicals, waste, and mold. Make sure tetanus shots are up-to-date (within 10 years). Discard water-damaged and visibly contaminated materials. Use waterproof boots, latex or rubber gloves, and other protective clothing. Use an N-95 NIOSH-approved disposable respirator, at a minimum, when handling mold-contaminated materials. Maintain a supply of clean water for drinking and washing. Assume that all power lines are live or energized. Establish and clearly mark a danger zone around down lines; stay at least 10 feet away. Allow only properly trained and equipped workers to repair electrical wires. Contact the utility company to de-energize and ground or shield power lines. Establish and clearly mark a danger zone where debris may fall onto workers. Use work gloves, a hard hat, work boots, hearing protection, and eye/face protection. Wear chaps when operating a chainsaw. Watch out for chainsaw kickback; do not cut with the saw tip. Don’t get too close to a chipper and never reach in. Use mechanical equipment to lift heavy objects. If not possible, use extra people and proper lifting techniques. Use safety procedures to prevent aerial lift tip-overs; use a body harness or restraining belt with a lanyard attached to the boom or basket. Use proper ladder safety techniques. Be aware of wet, slippery, or uneven surfaces. 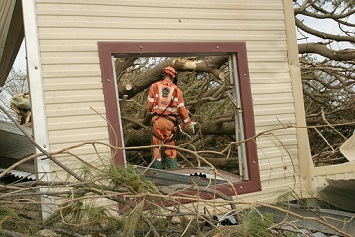 Never run a portable generator inside a house or enclosed space. Inspect cords to ensure they are in good condition with no frays. Use a ground-fault circuit interrupter (GFCI). Ensure that spaces where generators are used are properly ventilated. Shut down the generator before refueling. Fires reported at a chemical plant east of Houston, which was inundated by forty inches of rain dropped by Hurricane Harvey, highlight in the starkest possible terms the need to exercise all precautions in securing equipment and safety and restarting operations at flood-affected facilities with hazardous chemicals. The U.S. Chemical Safety and Hazard Investigation Board (CSB) is particularly concerned about restart. Houston and surrounding areas, extending into Louisiana are densely populated by large petrochemical facilities. The fires occurred at Arkema Inc.’s Crosby, Texas, plant. According to an Arkema statement, flooding caused loss of power and shut-down of refrigeration systems and also rendered backup emergency generators inoperable. The plant manufactures organic peroxides, which are highly flammable and burn if not maintained at low temperatures. Arkema said that after consultation with local public officials, it was decided that the best approach was to let the fires burn out. Based on their assessment of the situation, local officials had previously established a 1.5-mile evacuation zone surrounding the plant. The CSB alert notes that starting up a complex petrochemical process requires establishing stable flows, levels, temperatures, and pressures within large-scale equipment. “Startup requires and receives a higher level of attention and care than normal processing because numerous activities are occurring simultaneously and many automatic systems are run under manual control,” says the CSB. Using appropriate management-of-change processes before modifying any startup procedures, equipment, or staffing arrangements due to the impact of the hurricane. Making sure that adequate staffing and expertise are available before starting up, recognizing that human performance may be compromised due to crisis conditions. Evacuating nonessential personnel (including personnel in trailers) from the vicinity of process units that are starting up. Short checklists for “thoroughly reviewing” process equipment are included in the alert. Equipment damage that may be caused by flooding include voids created under tanks that may compromise stability; floodwater leakage into tanks; loss of insulation in furnaces; floodwater damage to many types of electric motors and drives; and debris and silt obstruction in sewers and drains. “The lists are not exhaustive and are not intended to substitute for any other procedures or checklists regularly used or developed in response to Hurricane Harvey,” notes the CSB. The CSB’s safety alert is here.